One of the great fringe benefits of writing books is that I get to read a lot of good books in the course of my research. I've been reading lots of first-person narratives of near-death survival experiences lately while working on my current book project which will be completed in the next two months. One such book is Yossi Ghinsberg's Lost in the Jungle . At one time, back when I was obsessed with getting to the jungle for the first time myself, I read anything and everything I could find related to jungle travel. Now, having been there and done that more than once, it began to have less appeal, and somehow I passed on Ghinsberg's excellent book a couple of times when I picked up the original hardcover edition in the bookstore and flipped through the pages. I now realize the mistake I made after recently reading this book, which I couldn't put down once drawn into the narrative. 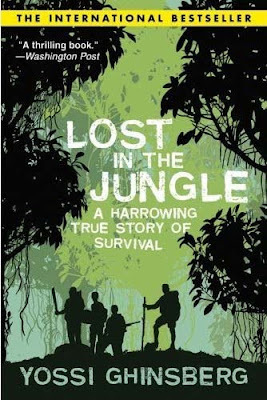 Lost in the Jungle is in fact a gripping account of a lone man with little knowledge of wilderness survival facing one of the most unforgiving wildernesses in the world - a trackless swath of the Bolivian Amazon along the remote and inaccessible Tuichi River. Ghinsberg is extremely fortunate that he lived to write his book. Two of the four companions he started out with on his ill-prepared trip were never heard from again. In the first part of the book as you read his account of how they ended up in such a predicament, it's hard to have much sympathy for any of them as you see mistake after mistake being made. But once Ghinsberg is alone and telling of his terrifying experiences after getting swept through raging rapids on a log raft when he becomes separated from his remaining companion, his descriptions of the difficulties the jungle presents and his methods of dealing with them with practically nothing win you over to his side. He turns out to be an incredibly tenacious survivor against odds that few experts would care to even contemplate. Even with his inexperience, he manages to find food, shelter himself from torrential downpours, survive a flash flood that nearly sweeps him away, extricate himself from quicksand bogs and fend off a prowling jaguar in the middle of the night. Awesome - sounds like a book I need to read as well. I don't plan on living in the jungle, but living hard up against the Texas / Mexican border, some lands matching that (sub tropical jungle) is conceivably close by in Mexican interior. I suppose a little knowledge of jungle techniques wouldn't hurt at all. Thanks for the review - I was not aware of it. Jungle techniques also apply well in the big river bottom swamps of the Southeast. The first time I visited the jungles of Honduras and Nicaragua, I was struck by how similar, rather than how different they were from the bottomland hardwood forests of Mississippi. It takes a special mindset to survive in that type of environment. While a misstep or a silly mistake could get you killed giving up or freezing up will get you killed a lot faster. Being able to examine an unfamiliar situation, think it through, make a decision and follow through will take you far. Obviously, nothing beats knowing how to do it in the first place. In stressful situations people typically resort to their training instead of rising to the occasion. There are a few rare exceptions but fortune tends to favor the brave. Believe it or not but I've seen it firsthand time and time again. Mindset is by far the most important survival trait that you can posses. Found this interesting article in Internet land - some good points to consider. Are you kidding! Have you seen pictures of what a machete can do in Rwanda. Have you seen a jaguar close up? The 3rd largest cat in the world, behind Indian Tiger and African Lion, they are BIG cats. As in 300 pounds, 8 feet long (including tail). And from what I understand, people is on their menu given the opportunity - they like their food supersized. No, not me, I'd rather have a shotgun if having to walk around in their territory. Even then, they are the superior predator. Jaguars are big, and are certainly capable predators. They don't seem to attack humans on a regular basis like lions, tigers and leopards do though. While it does happen occasionally, you rarely hear of a jaguar attack. The are secretive, but very common in many parts of Central and South America. We saw their huge tracks in the mud at many steam crossings in the Mosquitia region of Honduras and Nicaragua, but I never got a glimpse of one in the wild. Well, due to this review, I bought a copy of the book myself and was not disappointed - it is a good read. Had to shake my head on many of the decisions made by the hiking party (no map - lets just shoot the rapids and see what happens - etc.) - wow. The philosophy of simply wandering South America with what fits in a backpack was interesting too - reminded me somewhat of Jack Kerouac's book DHARMA BUMS. Just keep on the road and not worry about what tomorrow will bring - it'll take care of itself. The yearning for survival is more than an animal instinct, I think it carries us alot further and deeper. I can't wait to read this book, thanks for the review.